Since the advent of Microsoft products, most authors create their manuscript in Microsoft Word. The conversion of MS Word to Kindle format ebook can be a complex process if the MS Word documents are embedded with images, graphs, charts, tables, special fonts, text in multiple columns, and other special formatting. Word files insert many different codes into the Kindle file which can result in bad formatting. Email us the final version of the Microsoft Word file. After reviewing the MS Word file, we will quote you the total cost for the MS Word to Kindle conversion. We will also estimate the time required for conversion and inform you of any conversion restrictions based on your output conversion requirements. You are then emailed the login ID and password to preview the book on Kindle and to review the file for any other changes. If there are corrections required, you will need to send us the complete list of changes in one email. We will make the necessary changes (as per Kindle conversion standards) until the final output is to your satisfaction. After the final review, we will send you the final file which you can upload to your Kindle account. Please email us you word title at Bob@itglobalsolution.com. We can receive books up to 35 MB. If the book is larger, then you can upload it to our FTP server. Please contact us for login ID and password. 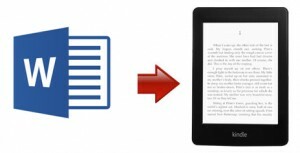 We convert Word to mobi/kindle for authors, publishers, and copyright owners. If the book is no longer copyright protected, then please provide us with details on it. If you have any questions on a word to kindle conversion, feel free to contact us at Bob@itglobalsolution.com or call Bob Mehta at Supremus Group on (515) 865-4591. We can convert from any format to Kindle file format or format of your choice. The solution is just a phone call away.